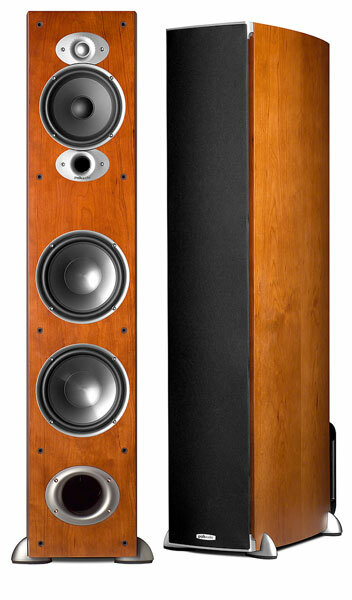 I wouldn’t be surprised if the Polk RTiA7 floorstanding speakers were in more living rooms than any other speaker. Or at least in the race for that title. All of which are damn hard to beat at this price point. The RTi speakers use the same tweeter and mid-range woofer across the series. Only bass woofer and size or woofers vary. So voicing in the series in near identical. Which is ideal if you are setting up a 5.1 or 7.1 home theater system. The RTi A7 use 2 – 7-Inch diameter polymer composite with rubber surround bass woofers with a ported cabinet. These puppies go all the way down to 20Hz, so there really is no need for a subwoofer unless you want more power in your explosions and thumps. With one 1 – 6-1/2-Inch mid-range woofer and a 1-Inch silk polymer composite dome tweeter. We were able to spend a fair amount of time with the bookshelf RTi A3 a few years back and remember it withÂ fondness. Â We did pair it with a rather warm solid state Van Alstine amplifier which helped toÂ accentuateÂ the rich mid-range of the RTi A3. Â But it was smooth and the high end was detailed and none fatiguing. Able to fill a huge amount of space and give off a very reasonable sound stage with good placement andÂ separation. Â The RTi A7 should do all that and much more on the low end. Â That massive port will give you an in room response all the way down to 20Hz. Â IncredibleÂ for speakers at this price point. These are easy to drive and should pair very well with any consumer level or slightly better stereo amplifier or A/VÂ receiver. Â But most likely if you spend a bit more for a good Denon or entry level Marantz you’ll most likely be more than pleased with the controlled base and extraÂ clarityÂ in the mid-range. Â One can bi-amp these as well to get even better performance. If we had any complaint about the RTi speakers we heard it was that if paired with to warm an amplifier the mid-range could become a bit muddled and vocals wouldn’t pop out as they should. Otherwise a fantastic speaker. Â Just read the reviews, we aren’t kidding. the polkaudio rtia7 is a god damm exellent speaker!!!!!!!!!!! !